Five Dates by Amy Jo Cousins is a bright, optimistic romance, the sort of story it’s unusual for me to fall head over heels in love with. I tend to like my romance served with a side of angst and wonkity darkness. But while older, out-of-dating-practice Devin and younger retail-job-loving Jay have some pain in their pasts, they’re both definitely ready for a forever kind of love. Devin has been helping his sister Lucy raise her kid since leaving their conservative parents behind after Lucy’s pregnancy revelation and Devin’s coming out. Devin’s sense of responsibility for his younger sister has had him confining his dating life to mostly meaningless hook-ups. But when he loses a bet to her, his sister puts a personal ad online and starts accepting dates…all based on a thirteen-year-old picture of him. Their deal is that he has to go on five dates, all of which must end with a kiss or they don’t count. Jay, on the other hand, has always had a thing for older guys. The problem is that his job as a retail store sales associate, which he just loves, wasn’t high-powered enough for his last older, sophisticated boyfriend. Still smarting from that guy’s disapproval, Jay is not keen in getting involved with another older man any time soon. So when he meets Devin, he’s disappointed and angry, but maybe still just a little bit interested. So when Devin begs for sartorial assistance for his next four dates, Jay is willing to help. Five Dates is a short, quick, sweet read that nevertheless manages to imbue the story with both sexiness and tenderness as well as enough family and friend context to make it a bigger book than it seems. Devin’s relationship with his sister and Jay’s relationship with his pregnant coworker showcase each man at his best, even when they’re not always displaying that to each other. It’s impossible not to root for them the whole way through and rejoice when, three dating misadventures later, Jay and Devin do get their happy ending. Best of all, Five Dates is still free on Amazon and many other ebook platforms. At a little under a hundred pages, it’s well worth the time it takes to read and will whet your appetite for Cousins’ future m/m romance releases, including Off Campus , a New Adult romance out this winter. I can’t wait! When Devin and Jay meet, Jay mostly sulks through an entire meal of Spanish tapas. But no one is going to sulk through this meal. This menu is “a production”, as my mother would say. Unfortunately, unlike some things that take forever and deliver limited enjoyment, it’s totally worth it. The first problem you may have is sourcing ingredients. There are a few things on this list that you may need to visit an international grocery store for and some you may need to creatively substitute: piquillo peppers, serrano ham and pimenton paprika may not be readily available everywhere, though I managed to find most of what I needed at my regular grocery store. Plus, all told, it took me about two hours of pretty much all hands-on time to pull together these four dishes. I was taking photos, of course, but I’m also pretty efficient in the kitchen, so I think my time estimate is probably still accurate for the average home cook. 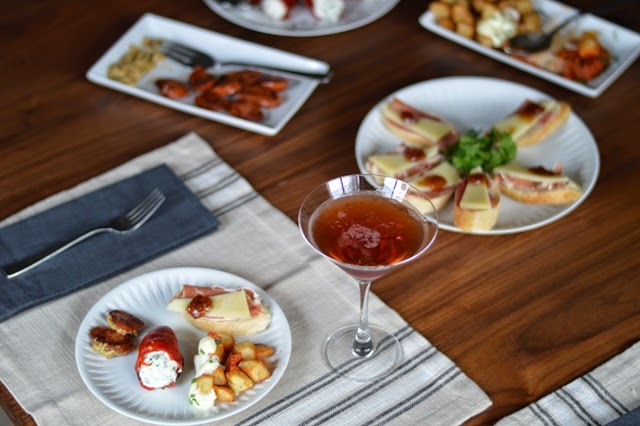 The reason I chose the recipes I did was that there are two cold dishes and two hot dishes, only one of which requires any effort: the patatas bravas. Since it’s literally my favorite tapas dish from my favorite tapas restaurant here in DC though, a place called Jaleo, I decided it was worth it. The problem is that both the hot dishes need to be served piping hot and so timing is important if you’re going to sit down and enjoy dinner with your guest. As far as the preparation goes, I have separated each of the ingredient lists and preparation steps, but they’re laid out in the the order I recommend preparing them. Prepare the stuffed piquillo peppers first. I actually let these sit in the fridge overnight and even though the Martha Stewart recipe says to chill for an hour, I’m confident that these can be made a day ahead without incident. They take about 30 minutes. Then prepare the aioli for the potatoes, which could also be done a day ahead and chilled. I also started heating the frying oil before making the bravas sauce. The bravas sauce goes next as it needs to cook for 20 minutes. Then I peeled and chopped the potatoes, adding them to the oil once it hit 250 degrees. Those cook for 10 minutes, which is the perfect amount of time to slice bread rounds and dress with the ham, cheese and fig spread. When the potatoes come out the first time and the oil is heating to 350 degrees, I seared the chorizo sausage. The potatoes need to fry for a second time, but that only takes about 5 minutes total so by the time the potatoes were done frying, the chorizo was seared. 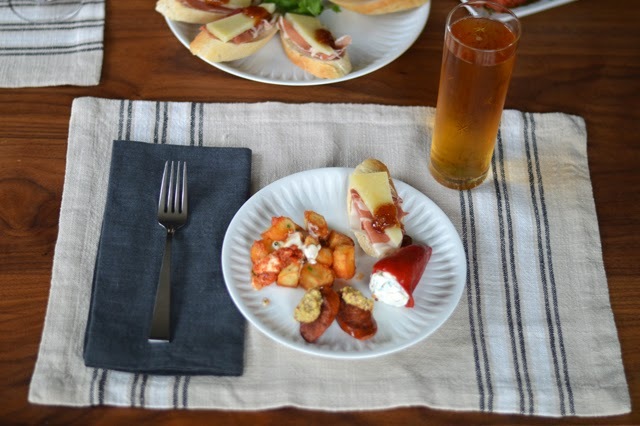 I had a second set of hands by then as my husband came home to set the table, pour drinks and start setting dishes on the table. I’ve sized these recipes to feed two people generously. 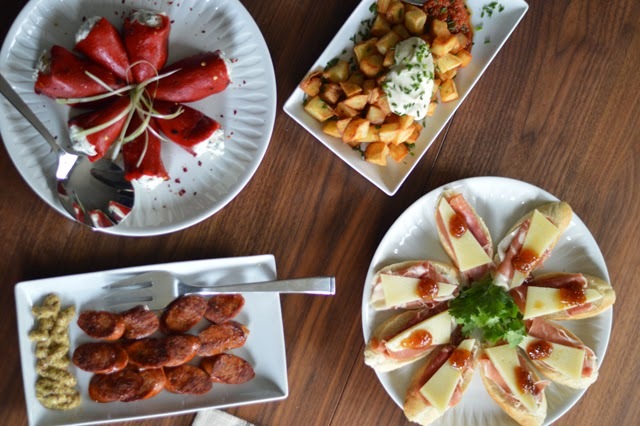 To feed four, you’ll need to use the patatas bravas recipe as written, the piquillo pepper recipe as written and four chorizo sausages instead of two. You’ll also need a half pound of Manchego, eight slices of serrano ham and 16 bread rounds. 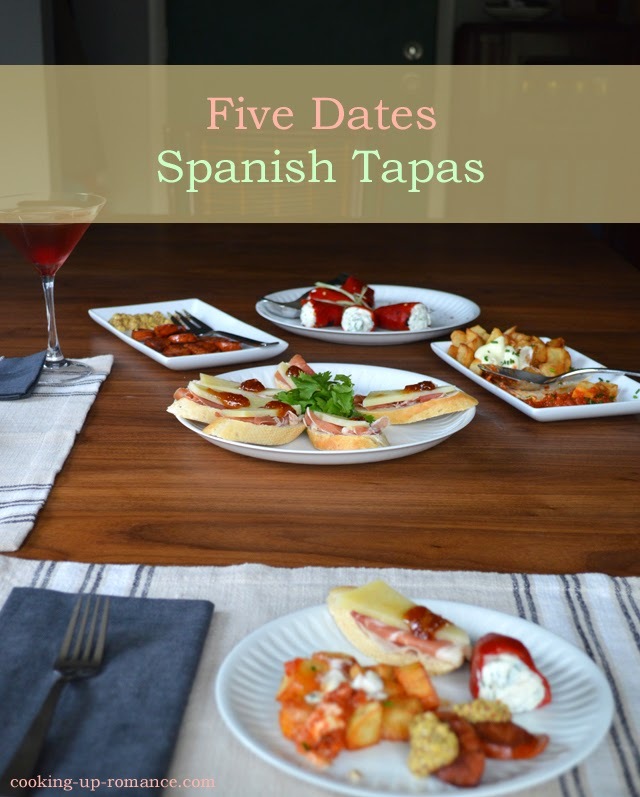 Oh, and despite the fact that Jay and Devin eat tapas on their first date, don’t try to do *this* for a first date unless you’re a really confident cook. Save it for the three-month anniversary or something. It will be worth the wait, I swear. 1. Combine goat cheese, green onions, mint, lemon zest, lemon juice and red pepper flakes. Mix until well combined. 2. 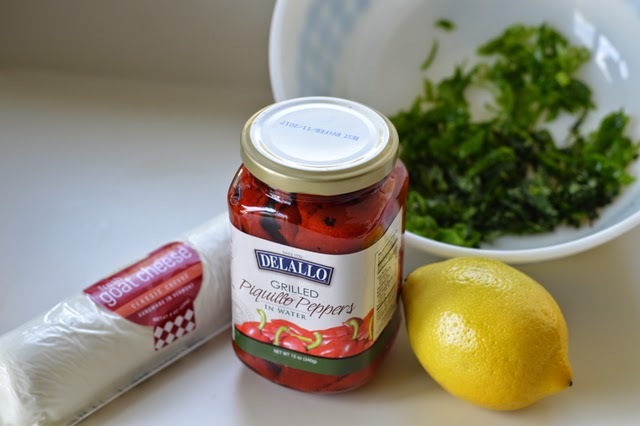 Using a small spoon or piping bag fitted with a large, round tip, fill each pepper with the goat cheese mixture. Place on a serving platter and serve immediately or cover and refrigerate up to 24 hours. 1. Break the egg into a mixing bowl. Add 2 tablespoons of the olive oil, the garlic clove and the vinegar. 2. Using an immersion blender or food processor, mix at high speed until garlic is pureed. Add olive oil in a slow, but steady drizzle while continuing to blend until you have a nice thick aioli. Salt to taste. If you experience problems with the aoli, visit the linked site. There are tips there for troubleshooting broken sauces. Refrigerate until ready to serve. 3. Cut each tomato in half lengthwise and remove seeds. Grate and then sieve tomatoes to produce 1 cup tomato puree or process halved and seeded tomatoes in a food processor. 4. Heat 1 1/2 tablespoon olive oil over low heat. Add the tomato puree, sugar, bay leaf, pimenton and cayenne. Allow to simmer for 20 minutes, or until mixture is reduced by 2/3rds, stirring occasionally. 5. Remove bay leaf, add vinegar and salt to taste. Set aside until ready to serve. 6. In a deep, heavy-bottomed pot, heat 4 cups olive oil to 250 degrees. Place the potatoes in the oil and poach them, frying slowly until soft, about 10 minutes. The potatoes will not changes color, but should yield easily when pierced with a toothpick. Remove to a paper towel covered plate with a slotted spoon. 7. Raise the temperature of the olive oil to 350 degrees. Return the potatoes to the pot, frying in batches until crispy and brown, about 2 minutes. Salt to taste. Repeat with remaining potatoes. 8. Spread brava sauce on a plate, top with potatoes, top potatoes with aioli and garnish with chopped chives. 1. 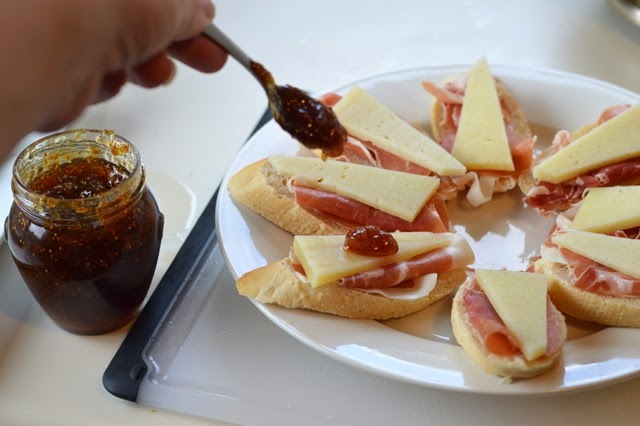 Layer half a slice of ham, a slice of cheese and a 1/2 teaspoon dollop of fig jam on each baguette slice. 2. Arrange in a circle on a platter, garnish with parsley. 1. Heat skillet over medium-high heat. Lay chorizo slices in a single layer and cook until seared on one side, about 3 minutes. Flip and repeat on other side. 2. Layer seared slices on a platter and serve with course brown mustard on the side. Disclosure: Amy Jo Cousins and I are friendly on Twitter.